I’m kicking off today’s list with a piece by ANU’s Dr Mathew Davies who cogently argues that the anti-IS and pro-Iraq strategy of the US needs to consider a post-Iraq Middle East . Systematically outlining the history of the Iraqi state as a construct with external backing and authoritarian government, he notes, ‘Central government, in the absence of open authoritarian repression and at least the benign neglect of Western powers, has never exerted political authority across Iraq organically. Yet the US strategy rests entirely on the vain hope that this time will be different.’ Instead, the US is sowing the seeds of more violence and trauma to come. Keep reading here . ‘Ukraine raises at least two issues that may inspire new thinking on strategic theory. One is the problem of recognizing success when it involves something less than victory.’ This observation comes from Joshua Rovner, writing on the Washington Post blog, Monkey Cage , on what Ukraine means for how we study war. It’s worth reading for its ideas on identifying success, and how the relationship between strategy and grand strategy means the Asia pivot has constrained US action over Ukraine. Sticking with Ukraine, here’s a new Loopcast podcast on the latest events with Dr Andrew Michta . The latest issue of Security Challenges contains several articles of interest to our readers, particularly one by David Schaefer on the impact of the information revolution on Australia’s foreign intelligence assessment process , and another by Shandon Harris-Hogan on the influence of family on the recruitment and retention of Australian jihadists . Also on Australian jihadists, Andrew Zammit examines why not all proposed new changes to national security legislation are necessary or justified . While many of the reforms stemmed from separate inquiries highlighting legislative shortcomings, he notes that the proposed reversal of the burden of proof—requiring Australians returning to Iraq and Syria to provide they weren’t involved in terrorism—departs from our legal traditions, is unlikely to address the threat effectively, and risks delegitimising necessary counter-terrorism efforts. Turning now to one of Australia’s key security partners in Northeast Asia, Tsjeng Zhizaho Henrick has an RSIS Commentary on the limits of Prime Minister Abe’s ambitions  in reinterpreting Japan’s constitution. He challenges the idea of Japan’s ‘right-wing drift’ and argues that public protests against ‘remilitarisation’ and a drop in Abe’s popularity may well constrain passage of further legislation. For this week’s technology pick, here’s a self-assembling, walking robot  designed by a team of Harvard engineers. Inspired by origami and the folding of insects’ wings, the robot can build itself in four minutes. But it’s not a true transformer: once the robot folds into its desired shape via internal heating elements, the joints cool and harden . 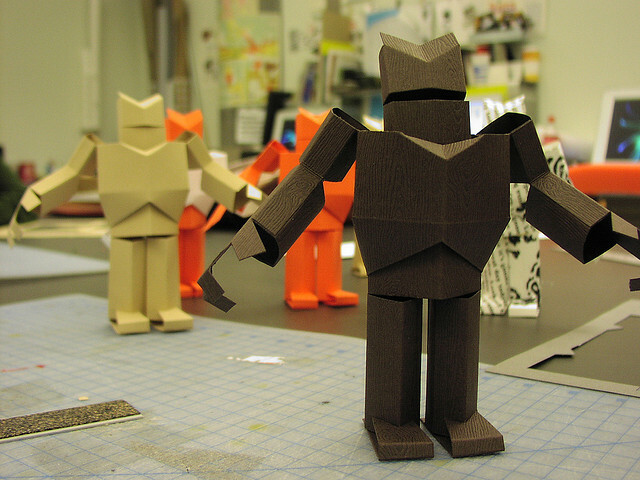 The long-term goal is for the durable origami-bot to be used on the battlefield or in space. For alliance wonks, CSIS recently hosted Dr Park Jin who delivered a Korean perspective on US–South Korea–Japan cooperation . Audio available here  (duration: 1 hour 24mins). Canberra: Professor Andrei Lankov will tackle the myth that North Korea is the world’s ‘last Stalinist economy’. He’ll discuss the DPRK’s private economy and its impact , Hedley Bull Centre ANU, Thursday 21 August at 3pm. AIIA ACT will host Dr Marcus Mietzner who’ll present on Indonesia’s recent presidential elections and how democracy survived , Thursday 21 August at 6pm. Melbourne: What’s the future of the US–Australian alliance? Hosted by AIIA VIC, ASPI Chair Stephen Loosley will discuss the changing strategic environment and its consequences for ANZUS , Wednesday 20 August at 6pm. Natalie Sambhi is an analyst at ASPI and editor of The Strategist. Image courtesy of Flickr user Kristian Bjornard .